Alpha Lipoic Acid – (other names: thioctic acid, 1,3-diothio-3-pentanoic acid, 6,8-dithio-octanoic acid, and lipoate) is a biofactor found in yeast, spinach and red meat and is an essential co-factor in energy metabolism. A co-factor is a substance, such as a co-enzyme, that must be available in order for another substance, such as an enzyme, to produce a specific result. Lipoic acid, a thiol, contains sulfur groups in a dithiol ring structure. After reduction by enzymes in the body to its dithiol form known as dihydrolipoic acid (DHLA), which has enhanced antioxidant activity, the source of its extraordinary power as a metabolic antioxidant. 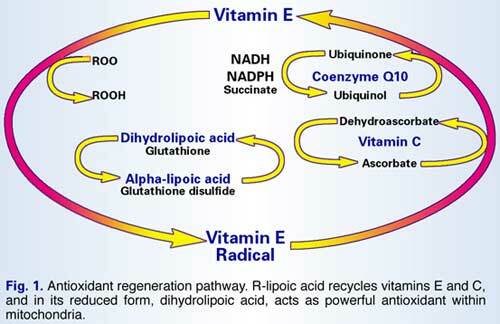 Two general types of antioxidants operate in biological systems: those associated mainly with a lipophilic phase (e.g., membranes or lipoproteins such as vitamin E and ubiquinols) or those which operate in aqueous phase such as ascorbate, glutathione and thioredoxin. Uniquely, lipoic acid as dihydrolipoate is able to interact with both phases and is a bridge between them. While new to Americans, lipoic has a long history in Germany of safe use to treat diabetes complications. 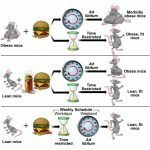 When present at sufficient concentrations, alpha lipoic acid acts as the anchor of the antioxidant network. We chose to use alpha lipoic and its reduced form, DHLA, to investigate its action in the redox cycling antioxidant system. Remarkable results were observed. DHLA readily regenerated vitamin C from its oxidized form in in vitro systems such as suspensions of human Low Density Lipoproteins (LDL), microsomal and mitochondrial membranes, and in tissues such as skin homogenates. 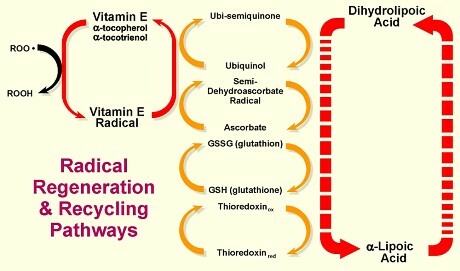 Dihydrolipoate decreased the steady state concentration of the vitamin C semi-ascorbyl radical and spared vitamin C and vitamin E from being lost, indicating that the inter-reacting redox-based antioxidant network system was operating as shown in the following scheme. The two negative electron reduction potential of dihydrolipoate/a-lipoate couple is -0.32V, much stronger than that of reduced glutathione (GSH)/glutathione disulfide (GSSG) couple (-0.23V). Glutathione is a protein which is easily digested, so glutathione levels cannot be effectively increased by oral supplementation. Pharmaceutical companies have long sought glutathione-boosting drugs, without significant success. Thus, we were delighted to find that a-lipoate boosted cellular glutathione levels. 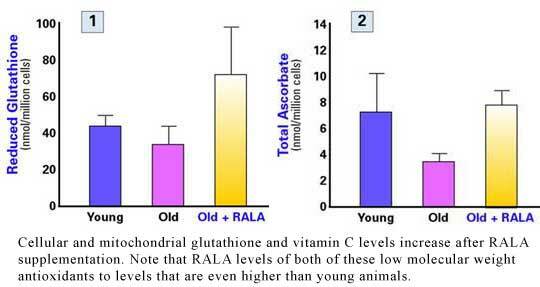 Levels of glutathione, the major cellular antioxidant in the body, decline with age. Low glutathione levels are associated with a higher incidence of diseases in the elderly. Glutathione concentrations are recognized as a predictor of susceptibility to disease, and as a marker of biological age. Among the cells which show large elevations in glutathione after a-lipoate treatment are human erythrocytes, keratinocytes and T-lymphocytes. Supplementation with a-lipoate substantially increases the glutathione concentrations in tissues. After tissue oxidative injury, drastic losses of glutathione are usually observed. 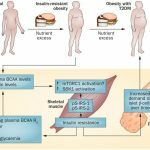 This is largely prevented if a-lipoate is therapeutically administered. 1) Dihydrolipoate is able to directly reduce glutathione disulfide. This increases levels of reduced glutathione which is the antioxidant and biologically active form required for antioxidant action and for glutathione transferase reactions. 2) Dihydrolipoate reduces cystine to cysteine. Membrane transport of cysteine into the cells is limited when this amino acid is in its oxidized form (as cystine). When a-lipoate is added to cells, it reduces cystine to cysteine in the extracellular space. The cell membrane transport for the uptake of cysteine is about ten times faster than that of cystine, thus accelerating its uptake and increasing the cell’s ability to synthesize glutathione. 3) Dihydrolipoate reduces oxidized thioredoxin to reduced thioredoxin, a signaling molecule. Lipoate, in its reduced form, DHLA, is the driving force for maintaining high concentrations of the reduced antioxidant (potent) forms of the major cellular antioxidants such as glutathione, thioredoxin and ascorbic acid in the aqueous phase, and vitamin E and ubiquinol in membranes or lipoproteins. The amount of alpha lipoic acid naturally present in the body may not be adequate to obtain the antioxidant benefits. Increasing the amount of alpha lipoic acid through dietary supplementation can help to perform this vital function. All these attributes make alpha lipoic acid the metabolic antioxidant par excellence.